Originally founded with only eight members, Nashville Calligraphers Guild has blossomed from those humble beginnings into a vibrant group of nearly 80 calligraphic artists from Nashville and the surrounding regions. The Nashville Calligraphers Guild was formed in 1981 to promote the continued study, practice, and use of calligraphy among its members, and to encourage community awareness of the art of calligraphy. The Guild began at the encouragement of instructor Sarah Schuyler with eight members. These eight ladies met monthly on Saturdays for lunch around Betty Gilpin’s kitchen table. There they shared calligraphy projects and became close friends. Mrs. Gilpin was elected as the first president of the Guild. Other officers were Nancy Rice, secretary, and Donna Robert, treasurer. Other founding members included Sandy White, Mary Lee Bowen, Patsy Burger, Betty Sanford and Deloris Rayner. This group called themselves the Crazy Eights. Soon after the Guild made it official, they began inviting other Nashvillians interested in calligraphy to join the group, and they began scheduling calligraphy teachers to present workshops in Nashville for members and for others interested in the calligraphic arts. The Guild has grown through the years and now meets at Plaza Artists Materials in Nashville. Previous meeting locations have included Betty Gilpin’s store, Cheekwood, Belmont University, Nashville State Technical College, Woodmont Hills Church of Christ, and Plaza Artist Materials. The Guild sponsors workshops and classes open to those interested in calligraphic arts. Workshops have been held at Betty Gilpin’s store, Cheekwood, Overton High School, Nashville State Tech, Belmont University, Volunteer State Community College, and Plaza Artist Materials. On Sunday, October 13, 1991, twenty-five Guild members and associates met at Woodmont Christian Church’s Counseling Center to celebrate the tenth anniversary of the Nashville Calligraphers Guild. Charter members Betty Gilpin, Donna Robert, Sandy White, and Nancy Rice were honored with exquisite certificates designed and lettered by Barb Bartels and mounted on hand-marbled paper made by Betty Wagner. Members reassembled a large calligraphic mural by returning a piece that had been included in the invitation. Betty Gilpin received special recognition as a Guild founder and driving force. Betty shared the early history of the Guild and its origin around her luncheon table as she and the other eight charter members met monthly to share their current projects and support each other. Betty also recognized the contributions of Sarah Schuyler whose work and spirit influenced many Guild members. Betty voiced the opinions of many when she said “Anything I’ve given to the Guild, I’ve received back…blessing, after blessing, after blessing.” The event ended in true southern tradition with a delicious meal. Special thanks were given to Guild president Carolyn Lovelace for her work in planning and coordinating the events of the day. Saturday, November 9, 1996, marked the fifteenth anniversary of the Guild. 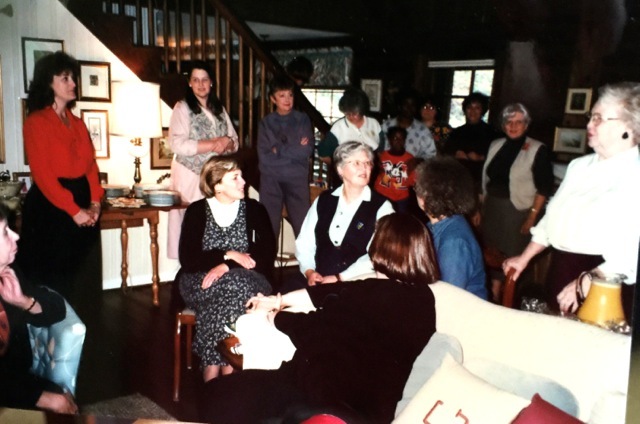 Following the meeting at Nashville State Tech, the group celebrated at Betty Gilpin’s home with a covered dish luncheon and a time to share fond memories of the origins of the Guild, the workshops, the exhibits, and other activities. September 15, 2001, marked the twentieth anniversary of the Guild. Following the regular meeting, members enjoyed a catered lunch by The Picnic. Members brought samples of their first calligraphic efforts, photos, and other memorabilia to reminisce. The Guild celebrated its 25th anniversary on September 9, 2006, with an exhibit entitled 25 Years, 26 Letters at the Centennial Art Center. Guild members reminisced as they enjoyed viewing the exhibit while sharing in a delicious lunch buffet brought by members and set up in the courtyard. Past presidents Vannah Husband and Carolyn Lovelace were presented certificates of appreciation. Nancy Rice and Lilo Regen were recognized for their contributions to the Guild with Life Memberships. Betty Gilpin was recognized as the first president and founding member. Renowned British calligrapher Peter Thornton presented his musical slide show Letters and How We Use Them. The anniversary celebration concluded with Sherri Kiesel Thornton’s presentation of her Pencil Letterforms workshop at the end of September. What began with such humble beginnings is now a vibrant and strong group of approximately 80 calligraphic artists from Nashville and the surrounding area. Mrs. Gilpin states that it is a blessing to see how the organization has continued and blossomed from the original eight members to where it is today. The Guild celebrated its 30th anniversary on Saturday, September 9, 2011, at the Lions Head Condos Clubhouse. Distinguished service awards were presented to Joyce Skaggs and Dee Hardesty. Sheryl Bracey was honored with a Life Membership Award. Members enjoyed their time together reminiscing about favorite Guild memories and past events. The Guild’s 35th anniversary was celebrated on Saturday, September 10, 2016, at the Lions Head Condos Clubhouse. The event was followed by the September Guild meeting and featured a Champagne Brunch catered by Love Language Catering. Guild exhibits have been presented at numerous locations in the Nashville area including Hendersonville Arts Council, Cheekwood, Church Street Center, Centennial Arts Center, the Green Hills Library, and others. Several years ago, Vicki Brandt had a dream of having a Guild retreat somewhere away from Nashville — a time for Guild members to gather and spend the entire weekend immersed in the various aspects of calligraphy and calligraphic-related arts. Vicki researched various state parks and other venues and settled upon Lake Barkley State Park in Kentucky. The first retreat came to fruition in February 2009, with fourteen Guild members in attendance. Attendance numbers have ranged between 14 and 27 (in 2015). Even though our retreat falls near the end of winter season, weather has never been an issue. Occasional snows have only enhanced the beauty of Lake Barkley. Each year, Vicki plans demonstrations and mini-workshops led by Guild members on everything from watercolor flowers to flourishing to Zentangle to background papers to everything imaginable. Most years the retreat also features a Trash and Treasures table where members can bring things that they no longer use or want to be given to someone else who can use the items. The past several years, Jennifer Allen of Paper and Ink Arts has graciously set up a mini store for the shopping pleasure of those in attendance. For those who have never attended retreat or been to Lake Barkley, it is indeed a treat. Each lodge room is a lake-view room, the conference rooms are spacious, and the food is wonderful. Vicki Brandt at Lake Barkley. Tenth Anniversary of the Nashville Calligraphers Guild. Charter members Betty Gilpin, Donna Robert, Sandy White, and Nancy Rice were honored with exquisite certificates designed and lettered by Barb Bartels and mounted on hand-marbled paper made by Betty Wagner. Fifteenth Anniversary celebration at Betty Gilpin’s home. NCG 30th Anniversary. Betty Gilpin, Barb Bartels, and Carol Percy. NCG 30th Anniversary. Dee Hardesty. NCG 30th Anniversary. Lynn Noga, Rose Wathen, Joyce Skaggs, Valerie Cypress and Vicki Brant. NCG 30th Anniversary. President Rose Wathen with Sheryl Bracey. NCG 30th Anniversary. Sheryl Bracey, Betty Gilpin, and Barb Bartels. NCG 30th Anniversary. Guild Founder and former president Betty Gilpin.